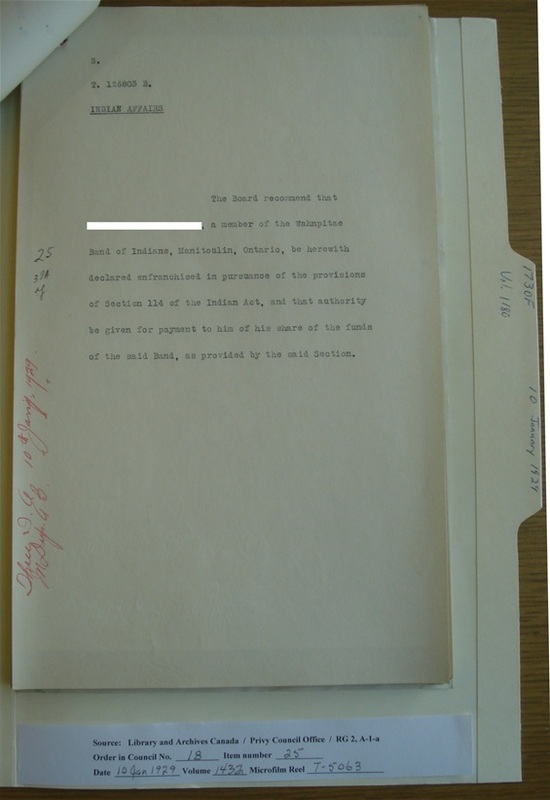 The Privy Council of Canada approved Orders in Council permitting Canadian Indigenous persons to become enfranchised starting with the Indian Act of 1876. An enfranchised person lost their status as an Indigenous person once they were enfranchised. We have photographed these enfranchisement Orders in Council from 1878 to 1940 and indexed the names of the persons contained in them. An alphabetical list of these names with the year of their enfranchisement is shown at the bottom of this page. Above the list of names is a list of the bands and agencies that these persons belonged to before enfranchisement. We plan on photographing and indexing the names contained in the enfranchisement Orders in Council up to 1960. We charge $10 to send a photograph of an Enfranchisement Order in Council. Below is an example of an enfranchisement Order in Council from 1929. The name of the person has been blocked out for privacy reasons. Hello Anna, the website Pier 21 in Halifax has a searchable database of ship arrivals. You can contact the Pier 21 staff for details about the passenger lists.